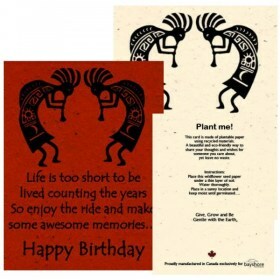 Happy Birthday-Kokopelli Image in Burnt Orange Plantable Card Assorted colours. These cards are made from recycled materials and are designed and made in Canada. A beautiful Eco-friendly way to share your thought and wishes for someone you care about, yet leave no waste behind. Comes with envelope in protective sleeve. Each card is embedded with wildflower seeds that will grow when the card is planted.